Department of Pharmaceutical Engineering and Technology, Indian Institute of Technology, (Banaras Hindu University) Varanasi - 221005, Uttar Pradesh, India. ABSTRACT: A simple, economical, accurate and precise high performance liquid chromatographic method was developed and validated for the determination of rifabutin. A Shimadzu LC-2010C HT version 3.01 system using a C-18 column with dimensions of 250 × 4.6 mm and silica particle size of 5 μm. Isocratic elution was employed with methanol, acetonitrile and water (75:25 v/v) were used. The flow rate was 1 ml/min, and effluents were monitored at 242 nm. The HPLC method was extensively validated for linearity, accuracy, precision (Interday precision, Intraday precision), repeatability and robustness. The exalted results receive of a drug were procured all significance values were established to be under the acceptable range in International Conference of Harmonization (ICH) guidelines requirements. The results demonstrate that the developed HPLC modus could be successfully used up for identification and quantification of Rifabutin in any form of the drug, with high resolution, accuracy, and precision. INTRODUCTION: Rifabutin is a semi-designed subordinate of Rifamycin S, it's an against bactericidal contamination which is used as a part of the treatment of Tuberculosis. It is effective against Gram-positive and some Gram-negative microscopic organisms by hindering the DNA-dependant RNA - polymerase of the microorganisms; it is moreover feasible against the high protein Mycobacteria, e.g. Mycobacterium tuberculosis, M. laprae and M. avium intracellular 1 - 3. 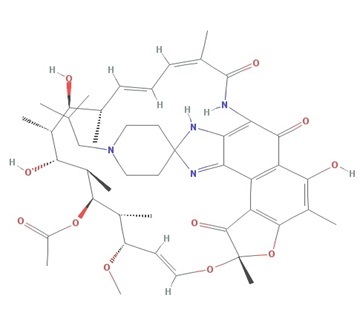 Rifabutin has exhibited the development against Mycobacterium avium intracellular restricted from the patients with AIDS. Rifabutin is true blue in United States Pharmacopeia and European Pharmacopeia 4. Affirmation of rifabutin in mass medicines and points of interest by spectrometric procedure and chromatography method were represented Rifabutin confirmation in natural cases like Human plasma, rat Urine was subjected to wide examination by unrivalled liquid chromatographic system 5 - 9. Another procedure for the HPLC confirmation of rifabutin is delineated in this paper. The technique is generously less complex, speedier and more monetary. IUPAC name of rifabutin is (9S, 12E, 14S, 15R, 16S, 17R, 18R, 19R, 20S, 21S, 22E, 24Z) 6, 16, 18, 20-tetra hydroxyl 1'isobutyl 14 methoxy 7, 9, 15, 17, 19, 21, 2 5 heptamethylspiro [9, 4 (epoxypentadeca [1, 11, 13] trienimino) -2H-furo-[2', 3' : 7, 8] – naphtha [1, 2-d] imidazol-2, 4'-piperidin]-5, 10, 26 - (3H, 9H) - trione - 16 - acetate 10. Apparatus: The liquid chromatographic method development was performed on a Shimadzu LC-2010C HT version 3.01 system (M/s Shimadzu Inc., Tokyo, Japan) equipped with a variable capacity quaternary pump, mobile phase degasser, column thermostat controller, UV-Vis detector 11. 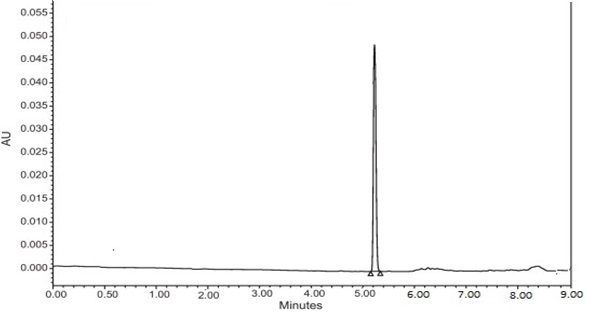 Chromatographic separation was attained using a C-18 column (M/s Thermo Scientific, Massachusetts, USA) with dimensions of 250 × 4.6 mm and silica particle size of 5 μm. 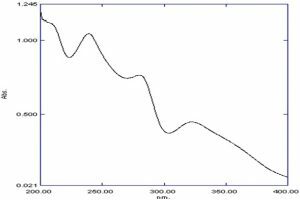 Isocratic elution was employed with methanol, acetonitrile and water with pH adjusted by using orthophosphoric acid used as mobile phase with UV detection at 242 nm 12 - 14. Before injection of the drug solution, the column was equilibrated with mobile phase for attaining saturation of the stationary phase. The data acquisition, analysis were performed with Shimadzu LC solution version 1.23 software 15 - 17. Reagent and Materials: Rifabutin was provided as a gift sample from M/s Simpex Pharma Pvt. Ltd., Kotdwar, Uttarakhand, India, used as the working standard. HPLC-grade methanol and acetonitrile were obtained from M/s Merck Ltd., Mumbai, India. An orthophosphoric acid of analytical reagent grade purchased from M/s SD Fine Chemicals, Mumbai, India, was used for the study. Distilled water filtered through a 0.45 μm Millipore PVDF (polyvinyl difluoride) filter were used. All other chemicals and reagents used in this study were of analytical grade. Mobile Phase: The mobile phase for chromatography consisted of acetonitrile + Methanol (1:1): Water (75:25) 18. Sample Preparation of Rifabutin: Rifabutin API was provided as a gift sample by M/s Simpex Pharma Pvt. Ltd., Kotdwar, Uttarakhand, India and its dosage form is purchase from the market. An accurately weighed quantity of rifabutin 10 mg was transferred to 100 ml volumetric flask and made up to volume with diluent. Samples were diluted to a concentration of 10, 20, 40, 60, 80 and 100 μg ml-1 and used for method development and validation study 19 - 20. 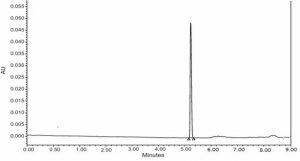 Chromatographic Conditions: Chromatographic separation was attained using a C-18 column (M/s Thermo Scientific, Massachusetts, USA) with dimensions of 250 × 4.6 mm and silica particle size of 5 μm. Isocratic elution was employed with methanol, acetonitrile and water with pH adjusted by using orthophosphoric acid 21 - 23. Method Development: The method utilizing Acetonitrile + Methanol: Water as mobile phase yielded broad peak, whereas with Acetonitrile + Methanol: Water tailing was observed with acetonitrile and methanol as diluent. During method development, a number of variations were tested like Acetonitrile + Methanol concentration and flow rate to give a symmetric peak 24. 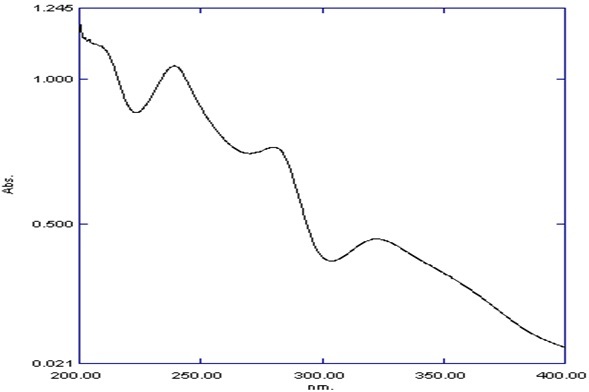 With a mobile phase Acetonitrile + Methanol: Water (75:25) at flow rate 1 ml min-1 and wavelength is 242 nm, the symmetric peak was obtained Fig. 3. Linearity: Six serial dilutions were prepared in a concentration range from 10 to 100 μg/ ml. A volume of 20 μl from each concentration of the solution was injected, and chromatograms were recorded; three independent determinations were performed at each concentration. 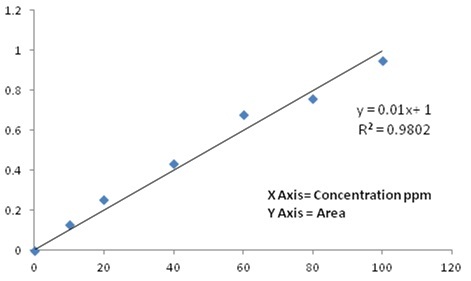 A linear calibration graph (y = 0.01x + 1; where y and x are peak area and concentration, respectively) was obtained over six concentrations 10, 20, 40, 60, 80, 100 μg/ml. A correlation coefficient was found to be 0.9802 25 - 27. Accuracy: To ensure the accuracy of the analytical method, the recovery studies were carried out. 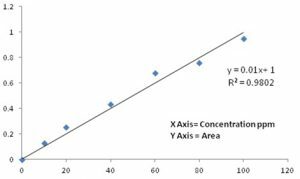 The known amount of rifabutin was added to a pre-quantified sample solution of its dosage form, and the amounts of rifabutin were estimated by measuring the peak area ratios and by fitting these values to the straight line equation of calibration curve 28. The recovery studies were carried out three times over the specified concentration range of rifabutin. The Accuracy was calculated at three different concentrations of drug which is equivalent to 80, 100 and 120% of the active ingredient by calculating the recovery of rifabutin with % RSD 29 - 30. Precision: The intra-day precision of the method was determined by repeat analysis (three identical injections) at three concentration levels. Inter-day precision was established by performing the analysis next day on a freshly prepared solution. The low RSD values of Table 2 indicate the ruggedness of the method 31, 32. The low RSD values indicate the ruggedness of the method. Repeatability: The peak area of 40 ppm drug solution was analysed six times on the same day. The % RSD was calculated for the resultant peak area 33 - 35. Robustness: The robustness was assessed by altering the following experimental conditions such as, by changing the flow rate from 0.5 to 1.5 ml/min, the mobile phase composition with Acetonitrile + Methanol: Water (76:24, 74:26) and analysed in triplicate. In all Chromatographic varied conditions, there was no significant change in chromatographic parameters 36. There was no effect of mobile phase composition on retention time as seen in Table 4. CONCLUSION: A HPLC method has been developed for the determination of Rifabutin. The proposed method is simple, rapid, accurate and precise. Its chromatographic run time of 10 min allows the analysis of a large number of samples in short period of time. Therefore, it is suitable for the routine analysis of Rifabutin. The results of the study reveal that the proposed HPLC method for the estimation of Rifabutin is simple and accurate in bulk and pharmaceutical dosage forms. 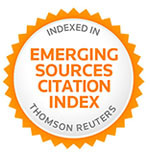 ACKNOWLEDGEMENT: The authors acknow-ledge M/s Simpex Pharma Pvt. Ltd., Kotdwar, Uttarakhand, India for providing the gift samples of rifabutin for the purpose of this study. One the authors acknowledge the University Grants Commission, New Delhi, India, for financial grants to carry out the Ph.D work. Mandal D, Kumar Dash S and Das B: Bio-fabricated silver nanoparticles preferentially targets Gram positive depending on cell surface charge. Biomedicine and Pharmacotherapy 2016; 83: 548-558. Anand BG, Thomas CKN, Prakash S and Kumar CS: Biosynthesis of silver nano-particles by marine sediment fungi for a dose dependent cytotoxicity against HEp2 cell lines. Biocatalysis and Agricultural Biotechnology 2015; 4(2): 150-157. Radovic-Moreno AF, Lu TK, Puscasu VA, Yoon CJ, Langer R and Farokhzad OC: Surface charge-switching polymeric nanoparticles for bacterial cell wall-targeted delivery of antibiotics. ACS Nano. 2012; 7: 251-259. Essa EA, Elkotb FE, Zin Eldin EE and El Maghraby GM: Development and evaluation of glibenclamide floating tablet with optimum release. Journal of Drug Delivery Science and Technology. 2015; 6: 269-277. Kim HJ, Seo KA and Kim HM: Simple and accurate quantitative analysis of 20 anti-tuberculosis drugs in human plasma using liquid chromatography – electrospray ionization–tandem mass spectrometry. Journal of Pharmaceutical and Biomedical Analysis. 2015; 102: 9-16. Boulanger C, Hollender E and Farrell K: Pharmacokinetic evaluation of rifabutin in combination with lopinavir-ritonavir in patients with HIV infection and active tuberculosis. Clinical infectious diseases : An official publication of the Infectious Diseases Society of America. 2009; 5: 725-731. Yadav AB, Muttil P and Singh AK: Microparticles induce variable levels of activation in macrophages infected with Mycobacterium tuberculosis. Tuberculosis. 2010; 90(3): 188-196. Hafner R, Bethel J and Power M: Tolerance and Pharmacokinetic Interactions of Rifabutin and Clarithromycin in Human Immunodeficiency Virus-Infected Volunteers. 1998; 42(3): 631-639. Else L, Watson V and Tjia J: Validation of a rapid and sensitive high-performance liquid chromatography–tandem mass spectrometry (HPLC–MS/MS) assay for the simultaneous determination of existing and new antiretroviral compounds. Journal of Chromatography B. 2010; 878(19): 1455-1465. 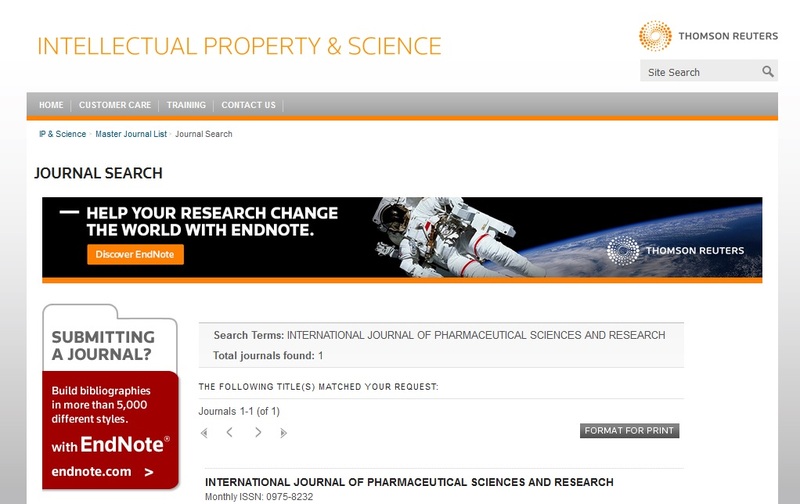 Value SJRI, Patil YD and Banerjee SK: Available online http://www.ijddr.in Covered in Official Product of Elsevier. The Netherlands RP-HPLC method for the estimation of Rifabutin in bulk dosage form. 2012; 4(2): 294-297. Raza K, Singh B and Lohan S: Nano-lipoidal carriers of tretinoin with enhanced percutaneous absorption, photostability, biocompatibility and anti-psoriatic activity. International Journal of Pharmaceutics. 2013; 456(1): 65-72. Feng H, Zhang L and Zhu C: Genipin crosslinked ethyl cellulose - chitosan complex microspheres for anti-tuberculosis delivery. Colloids and Surfaces B: Biointerfaces. 2013; 103: 530-537. Gaspar DP, Faria V, Gonçalves LMD, Taboada P, Remuñán-López C and Almeida AJ: Rifabutin-loaded solid lipid nanoparticles for inhaled antitubercular therapy: Physicochemical and in-vitro International Journal of Pharmaceutics. 2016; 497(1): 199-209. Subject Index. European Journal of Pharmaceutics and Biopharmaceutics. 2008; 70(3): 946-955. Krisko RM, McLaughlin K, Koenigbauer MJ and Lunte CE: Application of a column selection system and DryLab software for high-performance liquid chromatography method development. Journal of Chromatography A. 2006; 1122(1): 186-193. Monks KE, Rieger HJ and Molnár I: Expanding the term “Design Space” in high performance liquid chromatography (I). Journal of Pharmaceutical and Biomedical Analysis. 2011; 56(5): 874-879. Molnar I: Computerized design of separation strategies by reversed-phase liquid chromatography: development of DryLab software. Journal of Chromatography A. 2002; 965(1): 175-194. Beg S, Chaudhary V, Sharma G, Garg B, Panda SS and Singh B: QbD-oriented development and validation of a bioanalytical method for nevirapine with enhanced liquid-liquid extraction and chromatographic separation. Biomedical Chromatography 2015; (4): 611-621. Reinach B, Sousa G De, Dostert P, Ings R, Gugenheim J and Rahmani R: Comparative effects of rifabutin and rifampicin on cytochromes P450 and UDP-glucuronosyl-transferases expression in fresh and cryopreserved human hepatocytes. 1999; 121: 37-48. Oesch F, Arand M, Strolin Benedetti M, Castelli MG and Dostert P: Inducing properties of rifampicin and rifabutin for selected enzyme activities of the cytochrome P-450 and UDP-glucuronosyl transferase superfamilies in female rat liver. Journal of Antimicrobial Chemotherapy 1996; 4: 311-319. Schmidt AH and Molnár I: Using an innovative Quality-by-Design approach for development of a stability indicating UHPLC method for ebastine in the API and pharmaceutical formulations. Journal of Pharmaceutical and Biomedical Analysis. 2013; 78: 65-74. Jeong LN, Sajulga R, Forte SG, Stoll DR and Rutan SC: Simulation of elution profiles in liquid chromatography - I: Gradient elution conditions, and with mismatched injection and mobile phase solvents. Journal of Chromatography A. 2016; 1457: 41-49. Wang L, Zheng J, Gong X, Hartman R and Antonucci V: Efficient HPLC method development using structure-based database search, physico-chemical prediction and chromatographic simulation. Journal of Pharmaceutical and Biomedical Analysis. 2015; 104: 49-54. Boussès C, Ferey L, Vedrines E and Gaudin K: Using an innovative combination of quality-by-design and green analytical chemistry approaches for the development of a stability indicating UHPLC method in pharmaceutical products. Journal of Pharmaceutical and Biomedical Analysis. 2015; 115: 114-122. Chan C, Jin D, Dong N, Chen S and Mok DKW: Qualitative and quantitative analysis of chemical constituents of Centipeda minima by HPLC-QTOF-MS and amp; HPLC-DAD. Journal of Pharmaceutical and Biomedical Analysis. 2016; 125: 400-407. Mendez ASL, Steppe M and Schapoval EES: Validation of HPLC and UV spectrophotometric methods for the determination of meropenem in pharmaceutical dosage form. Journal of pharmaceutical and biomedical analysis. 2003; 33(5): 947-954. Helmy SA and Bedaiwy HM El: A new and simple HPLC method for determination of etamsylate in human plasma and its application to pharmacokinetic study in healthy adult male volunteers. Saudi Pharmaceutical Journal. 2013; 21(4): 405-410. Singh B, Singh R, Bandyopadhyay S, Kapil R and Garg B: Colloids and Surfaces B : Biointerfaces Optimized nanoemulsifying systems with enhanced bioavailability of carvedilol. Colloids and Surfaces B: Biointerfaces. 2013; 101: 465-474. Riva E, Merati R and Cavenaghi L: High-performance liquid chromatographic determination of rifapentine and its metabolite in human plasma by direct injection into a shielded hydrophobic phase column. Journal of Chromatography A. 1991; 553(C): 35-40. Kunitani M, Johnson D and Snyder LR: Model of protein conformation in the reversed-phase separation of interleukin-2 muteins. Journal of Chromatography A. 1986; 371: 313-333. Fox D, O’connor R, Mallon P and Mcmahon G: Simultaneous determination of efavirenz, rifampicin and its metabolite desacetyl rifampicin levels in human plasma. Journal of Pharmaceutical and Biomedical Analysis. 2011; 6: 219-226. Garg NK, Sharma G, Singh B, Nirbhavane P and Katare OP: Quality by Design (QbD)-Based Development and Optimization of a Simple, Robust RP-HPLC Method for the Estimation of Methotrexate. Journal of Liquid Chromatography and Related Technologies. 2015; 38(17): 1629-1637. Yao H, Vancoillie J, D’Hondt M, Wynendaele E, Bracke N and Spiegeleer B De: An analytical quality by design (aQbD) approach for a l-asparaginase activity method. Journal of Pharmaceutical and Biomedical Analysis. 2016; 117: 232-239. Patel A and Shah B: RP-HPLC Method Development and Validation using Factorial Design for Simultaneous Estimation of Thiocolchicoside and Etodolac with Forced Degradation Studies. 2014; 4(6): 374-382. Oliva A, Fariña JB and Llabrés M: An improved methodology for data analysis in accelerated stability studies of peptide drugs: Practical considerations. Talanta. 2012; 94: 158-166. Kochling J, Wu W, Hua Y, Guan Q and Castaneda-Merced J: A platform analytical quality by design (AQbD) approach for multiple UHPLC-UV and UHPLC–MS methods development for protein analysis. Journal of Pharmaceutical and Biomedical Analysis. 2016; 125: 130-139. Singh G and Srivastava AK: High-performance liquid chromatography method validation and development strategy for Rifabutin. Int J Pharm Sci & Res 2018; 9(9): 3903-07. doi: 10.13040/IJPSR.0975-8232.9(9).3903-07. Authors Address: Department of Pharmaceutical Engineering and Technology, Indian Institute of Technology, (Banaras Hindu University) Varanasi, Uttar Pradesh, India.